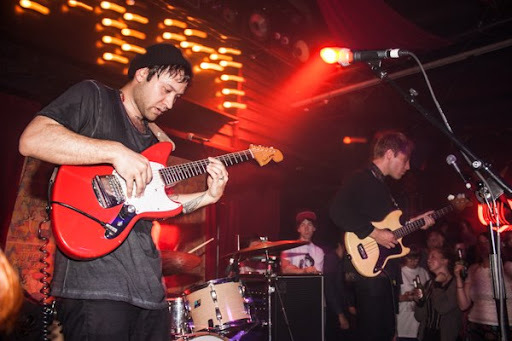 [Review] Unknown Mortal Orchestra (w/ Golden Axe, La Tetas) Cassette 9, Auckland | Shut Up Hamish! Kiwi ex-pat Ruban Neilson, previously of The Mint Chicks brought his latest Portland-based project to Auckland last night, playing Cassette 9 ahead of their opening slot for Weezer tonight. The band has been accumulating a large and dedicated fanbase, winning over the indie press with Pitchfork giving them a hype worthy 8.1 review for the debut self-titled album. 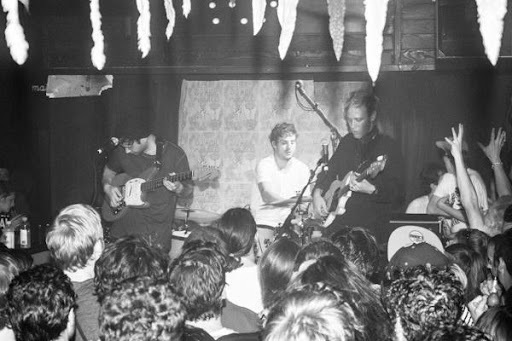 They’ve been selling out shows all around the world and playing festivals from CMJ in NY to the Pitchfork Festival in Chicago. In my opinion the hype and success is worth it, as Neilson and company demonstrated last night, with their set of psychedelic grooves and melodies, tight and impressive musicianship and above all, great songwriting. 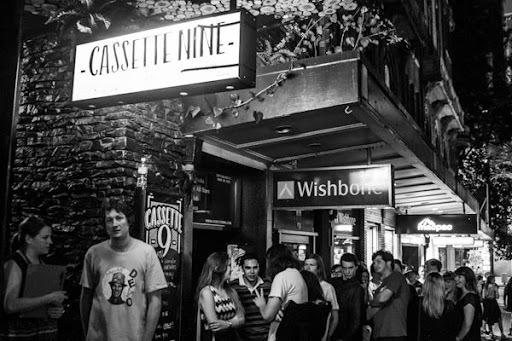 The night began with a 40 minute wait in the Cassette 9 line, as the venue was nearing capacity as early as 10pm. After waiting for the many guest list attendees to arrive the staff finally let in some of the regular punters waiting in line into the venue, and I managed to be one of those lucky few. Many of those in the sprawling line went home disappointed, as the modest-sized bar was not able to accommodate all those interested in the band. 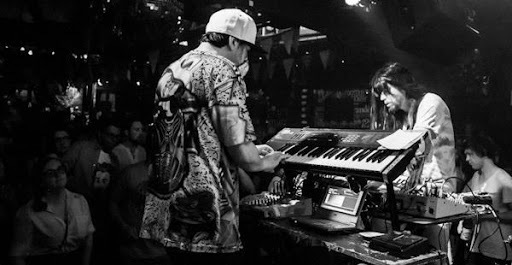 I managed to make it inside in time to see Auckland duo Golden Axe tear through a brief set of distorted, analogue, punky dance tunes. With the nimble keyboard fingers and characteristic wigs and gas mask microphones, Axe proved a highly entertaining beginning to the night. The tightness gained from the hours of international touring they’ve been racking up lately was apparent, although in all fairness this was the first time I’d seen them live so perhaps they’ve always been that tight. Next up was all female three-peice Las Tetas. They’re agressive, minor-key indie rock was a change in tone from Golden Axe but they won over the audience, ending with a thrashy cover of The Stooges ‘I Wanna Be Your Dog’. I approved. Unknown Mortal Orchestra finally took the stage at around 12.30, giving one last soundcheck before opening with an extended period of noise; strumming chords, rumbling bass and the drummer going nuts on double struck rolls all over the kit building tension, which would then release as the groove to ‘Little Blu House’ is introduced. The noise intro gave an opportunity to appreciate just what skilled musicians Ruban has gathered, especially the drummer whose skilled chops were immediately apparent. First song Little Blu House, a favourite of mine off the debut sounded great, although it took the sound guy a verse or two to get the vocal mix right. These are obviously three very skilled musicians, as they control the audience with ease, not by applying any forced live theatrics but rather by playing the songs with confidence and obvious enthusiasm. Ruban plays his guitar initially with the strap slung over one shoulder, and the body held high up to his chest like a gun. The melodies are ripped out from his fingers with so little effort he makes it look easy, betraying the years and years of touring and recording that have got him to this stage. The beginning of the set is dominated by tracks from the debut, peaking with ‘How Can U Luv Me’ (which is also probably the debut’s centrepiece). The crowd at this stage is going nuts and a mosh pit breaks out, of which I happen to be caught on the peripheral of, and the aggression of a drunk few seems slightly out of place given the chilled out vibe. Perhaps that handful thought they were at a Mint Chicks gig. After ‘How Can U Luv Me’ the band begin Pink Floyd/Barrett cover ‘Lucifer Sam’, of which I’m highly pleased to hear although sadly the band cut it off after only a few bars. Ruban tells the crowd “And it was going so well..” I’m unsure why they stopped the song, perhaps Ruban’s guitar was out of tune. Only having a tease of Lucifer Sam was a slight disappointment but they coped with the technical stuff up in a professional way, by launching into an entirely new song. It’s always a little awkward when bands have to restart a number. The next two songs are off the new album, ‘Monki’ and ‘So Good At Being In Trouble’ both of which contained strong grooves and melodies, a hint that the new album was to be just as strong as the debut. After this crowd favourite ‘Ffunny Ffriends’ is launched, with Ruban encouraging everyone in the crowd to clap, including “the cool people in the back”. The clapping dies off after the first chorus after which Ruban states he didn’t ask anyone to stop and the clapping starts up again. My attempt at clapping for the entire song is interrupted by another moshpit and I decide joining is the better option than getting stoically shoved around so I pogo’d my way to the front of the stage. New single ‘Swim Like A Shark’ is then played, before the show ends with a thrashy and epic rendition of ‘Boy Witch’. I hang around hoping for an encore though this was not to be, perhaps due to the fact that it was past 2am, or maybe this is the practice at Cassette 9. Never-the-less it was a great set, even with the abandonment of ‘Lucifer Sam’ and the at times overly excitable crowd. I felt privileged to see the band before they embark on sold out European shows in such an intimate setting and all for only $10! It’s good to see The Mint Chicks boys have success in their current projects, as both are extremely gifted musicians and songwriters and Ruban Neilson certainly deserves all the success that is now coming to him. With the new album released for download to those who pre-ordered it today, it is sure to be another big year for UMO and hopefully we will see them on our shores again soon.